As part of @OrbitalNYC Bootcamp, we have some crazy assignments. One assignment is to post something on Twitter/FB that gains 20+ retweets. What?! 20 retweets is a lot!! Another assignment is to get someone to write a blog/news post about something you made. The first bird was part of the ongoing market-fit experimentation I’ve been doing. I’ve been testing user segments & channels to figure out WHO is interested in a product like Kollecto. I’m learning, for example, that young real-estate brokers love my project! I’ve also been getting interest from tech early-adopters. So I wanted to, more thoroughly, test this segment. To do this, I went to ProductHunt.com and searched for Art startups. I then emailed ~5 people who had submitted art startups before. I got responses from 2 people- and Jack Smith was kind enough to write the post for me. Then, I posted a tweet about the Product Hunt post & sent emails to my network asking them to upvote the link. My upvotes ended up being ~65% from friends & 35% organic. I ended up with 13 favorites & 18 retweets (not 20, but close)! Test the ‘tech early adopter’ market (this went well & I got lots of signups- the Product Hunt post drove ~40% of my signups to-date). To prep for this campaign I read the Autosend article on how 23 startups got their first users. It gave me lots of ideas!! I was also really inspired by an article Gary Chou shared on ‘the forward intro email’ by roybahat. 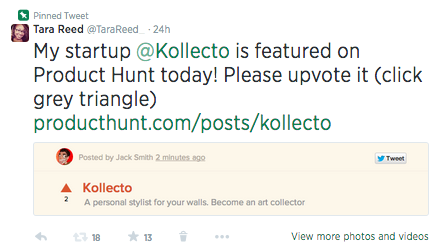 I applied the tactics in the article when asking people to post Kollecto on Product Hunt.